The best RI bagel I've had comes from Bagel Gourmet. Having grown up in New York City, I have fairly high standards for my bagels. To me, a proper bagel is one hot out of the oven from H&H Bagels and preferably eaten on the way to a relaxing stroll through Central Park. So when I woke up Saturday morning craving a bagel, I woke up with a mission. I already knew that Bagel Ole on Thayer didn’t cut it, and although I do love the seeded bagels at Olga’s, they’re really not bagels in my opinion, but a tasty bread in the shape of a bagel. Awhile back, we had read that the supposedly amazing Barneys Bagels (since closed) has been reincarnated through Palmeri’s Bakery. We had gotten these once before, but I couldn’t quite remember how they ranked, so we started there. I’m sorry to report the bagels were way too thin and dry (more like a piece of toast than the soft, doughy bagel I was hankering for) with a stingy amount of cream cheese. Time to move on. (As an aside, their challah bread, on the other hand, is absolute perfection). 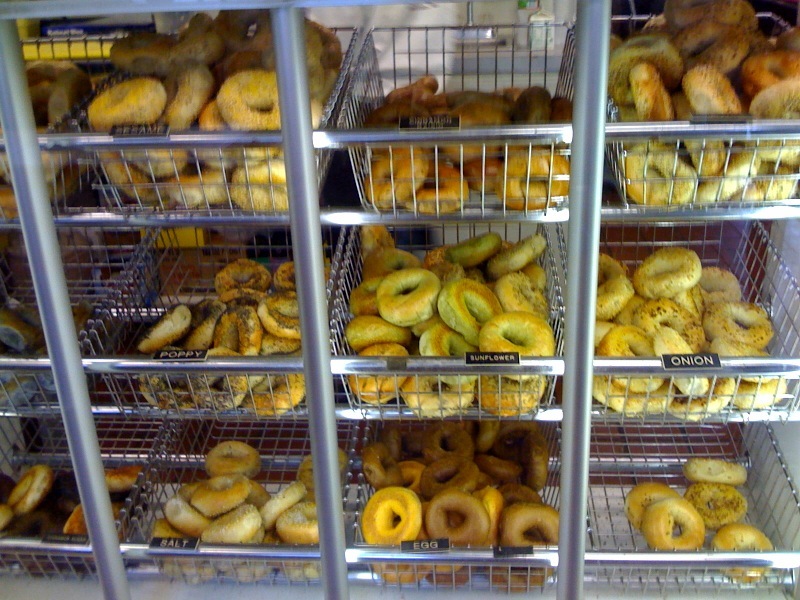 Bagel Gourmet offers a selection of bagels baked fresh daily on the premises. After my half-eaten attempt, we headed over to Bagel Gourmet on the East Side. This place is beyond unassuming — a dated sign hangs over their tiny shop in a mini strip-mall. But when I walked in, I could smell the bagels — mmm. Then I placed the same order — everything bagel toasted with cream cheese. When I got to the car to unwrap my prize, I was pleasantly surprised — a soft airy center with a chewy outside (and slathered in cream cheese). No, it’s not H&H. However, to be fair, I’ll have to show up at Bagel Gourmet at 6 am when the bagels come out of the oven, since for optimal deliciousness, a bagel’s half-life is only a half hour. Which is why it doesn’t even pay to have bagels to shipped from H&H. Not to mention, when a ‘wooly’ strikes, even next day delivery isn’t soon enough. People think that making outstanding bagels at home is really difficult, but it’s really no harder than making a loaf of bread…and can be done within about an hour. Don’t be discouraged if your bagels look at bit funny at first, you’ll get the hang of it in no time, and those curiously shaped bagels will still beat supermarket bagels hands down. What makes a bagel different from other breads is the two stage cooking process. A bagel is first briefly boiled, and then baked. 1-¼- 1-½ cups of warm water. Mix all the ingredients in a bowl. The dough should feel stiff, but add the extra water if it’s really stiff, or you can’t get all the dry flour incorporated. Cut the dough into 8 equal sized balls, and let rest for 10–20 minutes. Now, take each of the dough balls and using two hands, roll it into a little snake on the counter. When the snake is longer than the width of your two hands, wrap it around your dominant roiling hand. The dough rope should be wrapped so the overlapping ends are together at your palm, near the start of your fingers. Now take the two overlapping ends, and use your palm to squish/roll these two ends together. Once the dough is fused, you should have a perfectly circular bagel-to-be! While you’re at it, Pre-heat your oven to 425. Wow — thanks! This seems like a good project for my husband to try since he’s the resident chef around here. I’ll let him know. 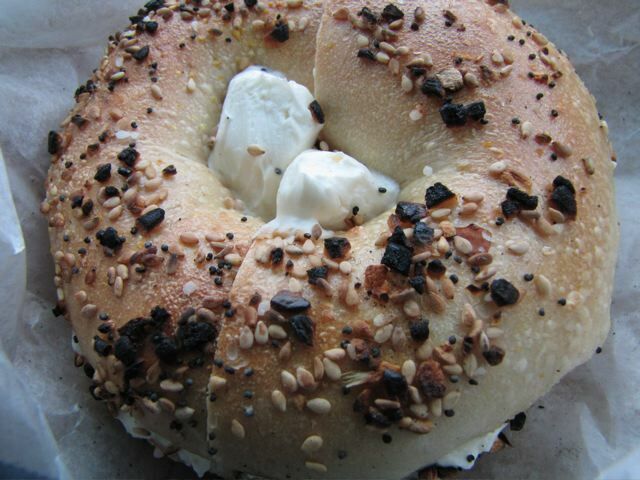 try the bagel shop in barrington. the olive cream cheese is sooo good. Just so you know, Bagel Ole on Thayer is actually Bagel Gourmet Ole, and is the second shop owned the by the people who own Bagel Gourmet. So they actually have the same bagels. I’d recommend the cinnamon sugar bagel, and they also have many wonderful cream cheeses, and, inexplicably, Mexican food after 11 am. That’s pretty funny — that confirms my suspicion that the fresher, the better. By the way, I had a few H&H bagels in NYC last weekend (whatever was hot — one day cinnamon raisin, another day sourdough) and they were as amazing as I remembered. Been to Bagel Gourmet – didn’t get to try the bagels because of the COCKROACHES! We went in a couple of years ago and there were cockroaches running all over the bagels in the display. We left without our bagels. I can’t imagine how many cockroaches there must be in that place because cockroaches don’t like the light of day. Maybe they have cleaned up their act but I wouldn’t go back. I told the person at the counter about the cockroach I saw and he didn’t act surprised. Still looking for that great bagel – without bugs. It’s possible, although I’ve never seen one there myself and I have been there quite a few times. I have to say when I lived in NYC I became obsessed with the Dept of Health inspection reports at http://www.nyc.gov/html/doh/html/rii/index.shtml and eventually gave up when I found out Magnolia Cupcakes supposedly had vermin (although I see now that’s been cleared from their report). Thanks for your post! I found RI’s health inspection website here http://food.ri.digitalhealthdepartment.com/. No mention of cockroaches but the Bagel Gourmet had a recent food violation for leaving eggs out on the counter for an indeterminate amount of time. You’re right – these websites can make a person never want to eat out. well I dont know were you went or if you are just making this up. I been working at Bagel Gourmet for the last four years and I never seen any cockroaches. I go in at 5am every morning and when we turn on the lights there is nothing to be afraid off. Yes is true that the store is very small but we work hard to maintain everything clean. It was just after we moved here in 2007 that I went there and saw the cockroaches so that was a while ago. I am glad to hear that things are clean now, but I still don’t think I’ll be returning! The best bagels ever are at My Favorite Muffin on 1535 Post Road in Warwick. People come from all over and say the same thing. I know people from NY who state they are better than the ones there and that is saying a lot! Their muffins are also the best that I have ever had. They are light. They also sell many varieties of their mini muffins so you can try more than one. The place is also spotless and super clean. If you want amazing bagels and a true quest go to Spot. It’s in Norwood, Ma and they are better than most NY bagels I’ve had. My fave is sesame untoasted( that’s how good they are) with bacon scallion cream cheese. Bristol Bagel Works is worth trying. They have a good selection of flavors, and they are fresh all day, as they keep bringing them out from the oven. They’re (naturally) in Bristol on Hope Street, south of State.